I went to the MIT Fall Career fair in search of a systems or web backend internship — a job working closer to computer machinery than to a user. Yet, nearly all recruiters I approached would glance up at me and immediately ask, “Frontend?” — referring to a job more focused on building user interfaces. Despite stating an interest in systems, recruiters continued pitching and pushing their frontend development internships, even when I told them over and over again that I was looking for something else. The “stack” characterizes how far code operates from the computer machinery. Code that processes and stores data or deals more directly with computer architecture, also known as the “backend,” is considered low on the stack. Code that operates closer to the user, also known as the application “frontend,” is high on the stack. Stereotypes arise because frontend professions seem to attract a different demographic than backend professions. The conventionally held bias is as follows: the more fashionable and feminine, the higher up on the stack someone must work. The more introverted and technically brilliant, the farther down on the stack they must be. This has clear implications for the treatment of women in technology. Stereotype threat describes the phenomenon in which being stigmatized decreases one’s satisfaction and contentment. Sue Gardner’s report Why Women Leave Tech cites stereotype threat as one of the main reasons women do not advance in their careers, risk burnout, and prematurely leave the industry—the “leaky bucket” phenomenon. More women working in fields stereotyped as less technical would enhance stereotype threat — peers would associate being female with being less technical, which would have a negative effect on confidence. As such, I hypothesize that this bias causes women to choose less technical product management and design-oriented jobs. Information currently exists about the overall gender ratio of tech (credit: Tracy Chou), but there is no information specific to each specialty — e.g. frontend web, mobile, machine learning, systems, etc. I wanted to quantify the degree to which women are in fields considered less “legit” or technical, as well as what causes women to choose these fields. I created a survey collecting data on gender, race, technical background, and field of work from each participant. I also asked each participant to report, in their opinion, the technical difficulty of each of thirteen fields ranging from frontend web development and growth hacking to systems engineering and data science. Note that the purpose of these rankings was not to quantify the actual difficulty of each field. Instead, I wished to capture people’s perceptions—how they intuitively perceived the technical difficulty of each field, and consequently how they viewed the technical aptitude of the people working in those fields. I collected responses from over 730 individuals. The survey was distributed primarily over social media (Facebook and Twitter), and was pinned to the top of several Facebook groups populated by high school and university students in computer science. As such, the data collected is biased towards the demographics and perceptions of students in computer science. However, I am satisfied that the survey circulated widely enough to accrue a diverse sample of CS students and young professionals from strong computer science programs. 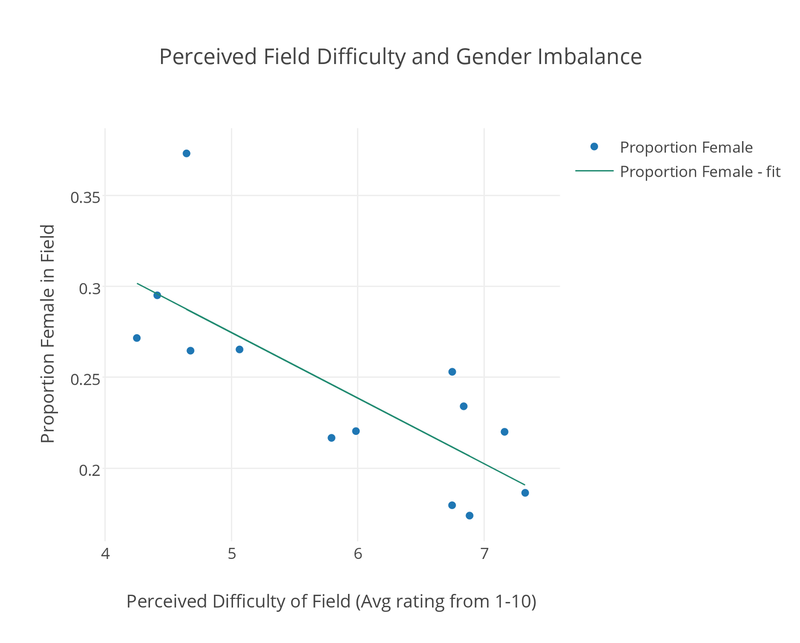 I found that perceived field difficulty—the average difficulty rating assigned by the 730 survey participants—correlated inversely with the proportion of women in that field. This correlation is demonstrated in the graph below. Each data point on this graph represents the collective data on each of the 13 studied areas in tech from all 730 participants in the study. A linear regression yielded a p-value of 0.0027, indicating that perceived field difficulty is a statistically significant predictor of the proportion of women in a given field. In other words, the data shows a mathematically strong correlation. Also important is the difference between the perception of frontend and backend fields. Fields considered lower on the stack — namely, data science, security engineering, and systems/infrastructure — uniformly received the highest difficulty ratings. To more directly study this bias, I examine the two fields with direct frontend and backend counterparts, mobile and web development. Assuming that the distribution of participant ratings for each field is a normal distribution, I performed a t-test for two independent means to determine whether the difference between frontend and backend ratings for each field was statistically significant. I calculated a p-value of < 0.00001 for both domains, statistically validating the existence of frontend vs backend bias. What causes more women to be in frontend positions? If women independently choose a specialization, with no external influence, there would be no problem with the inherent choice. Yet, if this phenomenon is the result of bias, stereotype threat, or some other coercive factor, then it indicates an environment particularly unfriendly to women in certain areas of tech. I considered two reasons for the discrepancy and examined whether the data was consistent with these hypotheses. 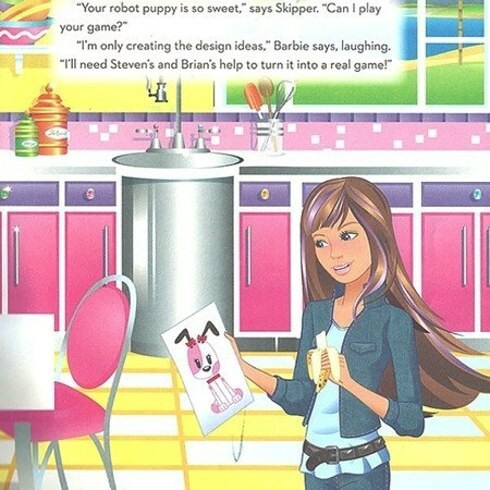 Hypothesis 1: Women tend to start studying computer science at a later age. Those who start at a later age tend to choose areas higher on the stack. This implies a need for earlier CS education targeted towards girls. 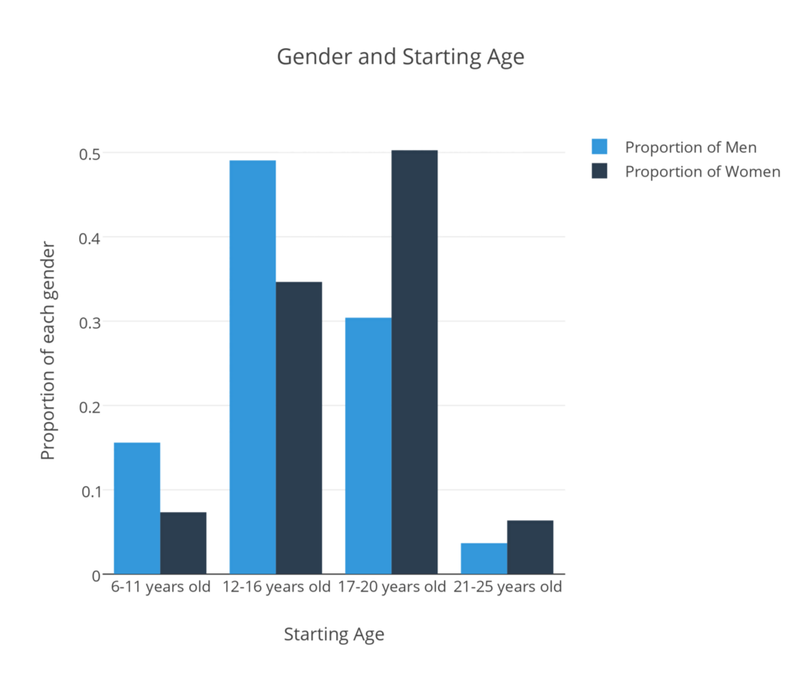 The diagram to the left graphs the percentage of each gender that begins coding at each age. On the whole, men are more likely to start coding earlier in life than women. Over 60% of men surveyed began coding at age 16 or earlier, whereas nearly 60% of women began at age 17 or later. Speculating on the cause for the discrepancy, perhaps women tend to start coding when they take their first computer science class—either AP Computer Science in high school or an introductory programming course in college. Years of experience naturally are associated with having a higher degree of skill in a particular field. Perhaps women feel, on average, “behind” their male peers. Perhaps all individuals who start later are attracted to areas perceived as “easier,” because they are less confident about their skills. To quantify the effect of starting age on one’s later choice of field, I divided survey participants into two groups: those who started coding when they were younger than 17 years old, and those who started coding when they were 17 or older. The purpose was to determine whether starting earlier affected eventual perceived field difficulty. The graph to the left shows the results. While the results may seem to follow the same trend as in the “Perceived Field Difficulty and Gender Imbalance” graph, a linear regression yielded a p-value of 0.12. This measure indicates that the coefficient of perceived difficulty of field is not a statistically significant predictor of starting age. I also examined trends within each possible starting age group. 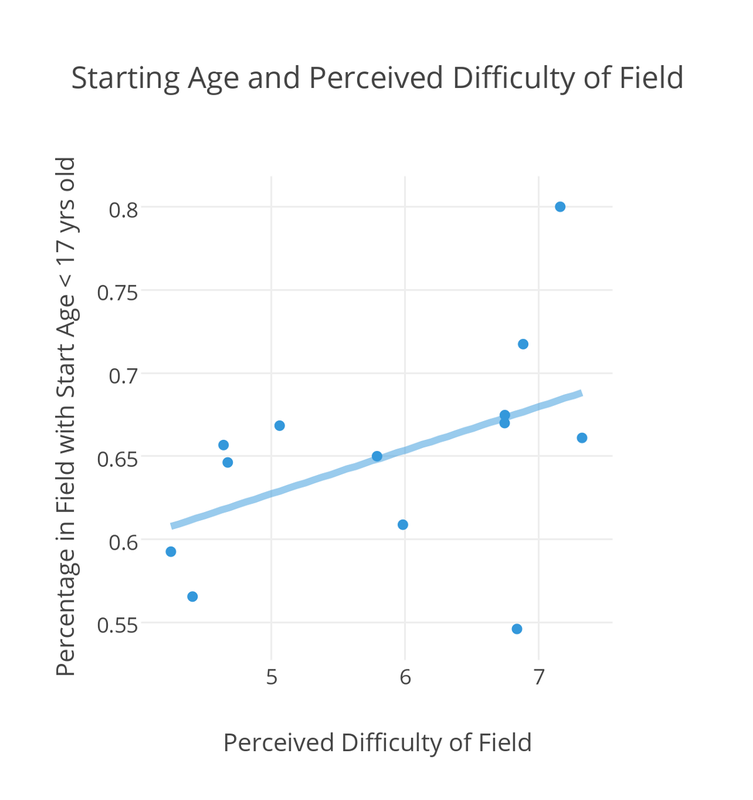 Options ranged from “< 5 years old” to “> 25 years old”; I found no statistically significant correlation in any age group to perceived difficulty of chosen field. Hypothesis 2: Women perceive their chosen fields as less technically difficult, implying a lack of confidence in ability. Low confidence indicates impostor syndrome. The survey asked the participants to rate all thirteen fields studied. This allows examination of how technically difficult each participant considers his/her field in comparison to the average software engineering position. Specifically, for every participant in the study, I calculated the difference between that person’s rating for their fields(s) compared to their average rating of all fields. I separated results out by field, and then by gender within each field. The graph below shows the results, with fields listed in order of increasing average perceived technical difficulty. The above graph compares how women and men perceive the difficulty of their own field compared to all fields surveyed—i.e. how skilled they thought their fields required them to be. In nearly every field, women felt as if their fields were less technically difficult than men did relative to other professions. This demonstrates that women, far more so than men, perceive the technical skills they possess to be, on average, lesser in comparison to others. The graph above depicts individual biases — how critically each participant judges him or herself. That women judge their technical capabilities more negatively than do men reveals the confidence gap between the two genders. As seen from the graph, this gap is particularly significant among the fields rated most technically difficult. As Sue Gardner addressed in her article, individuals with higher confidence are shown to be perceived as smarter. Studies have also demonstrated that individuals with more confidence tend to have more successful careers and opportunities for advancement. 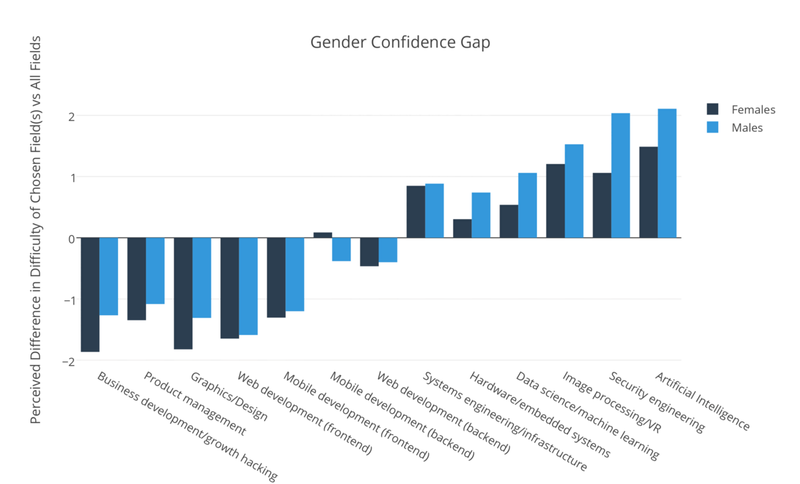 Perhaps, then, the root of the gender discrepancy in certain areas of tech is lack of confidence. This problem is not unique to computer science. Yet, the confidence gap has unique implications when choosing a specialty within the field. According to Glassdoor, the national average frontend software engineer salary is $99,032. The average backend software engineer salary is $131,950. If underlying biases push women towards lower paying fields, then it is small wonder that the leaky bucket phenomenon exists. Yet, stereotypes entrenched in the industry have the potential to slow or even reverse progress made by women’s outreach efforts. That half of the entire field—positions lower on the stack—seems unappealing to women is a problem. Efforts encouraging women to go into computer science do nothing to change entrenched stereotypes within the field. Until we can eliminate the biases pushing women from certain areas of the industry, women will never feel like they truly belong. The raw data from the survey can be found here. Special thanks to Michael Lu for reviewing my statistical analysis of the data. Thanks to Tom Erdmann, JeremyRubin, Ishaan Gulrajani, Richard Ni, and Tess Rinearson.